While showing resilience along with the Asian peers, the Indian Equity Markets got off to a much better start on Monday despite weak overnight closing of US Markets. In a session that remained much range bound on Monday, the NIFTY had a relatively steady session and ended up gaining 47.75 points or 0.47%. As we approach Tuesday, we expect up move to continue. 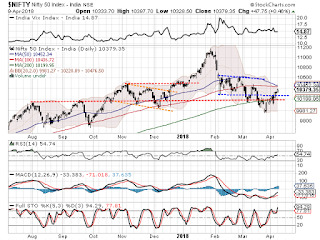 However, Markets are showing some signs of impending consolidation but despite such intermittent mild consolidation moves, the NIFTY is all likely to advance towards its 100-DMA and 50-DMA zones which remain in close vicinity of each other. Tuesday will see the levels of 10430 and 10450 will play out as immediate resistance area for the Markets. Supports come in at 10330 and 10275 zones. The RSI on the Daily Chart is 54.7432 and it has once again marked a fresh 14-period high which is bullish. RSI stays neutral showing no divergence against the price. The Daily MACD is bullish while it trades above the signal line. Apart from a white body that was formed on Candles, no significant pattern was observed. If we analyze the overall structure of the charts, the Markets are very comfortably placed in a 27-month long upward rising channel on Weekly Charts. On the Daily Charts, it has broken out from a small falling channel that it had created since beginning of 2018. Overall, though chances of some consolidation, sooner or later, cannot be ruled out, we expect the NIFTY to continue with its advancement. 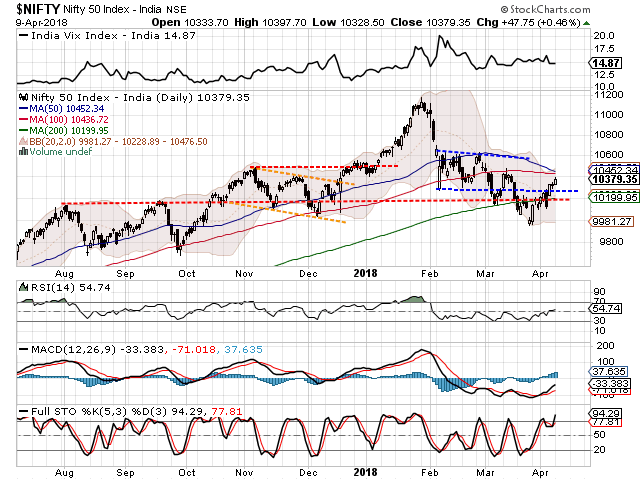 We expect this upside to continue and we will see Markets taking some breather between 10430-10450 range where the 100-DMA and 50-DMA converge. We expect some consolidation happening there. Until this happens, with each move that result into consolidation or a mild corrective wave, these opportunities should be utilized to make select purchases. The underlying structures of the Markets remain stable. Longs were seen being added on counters like ICICI BANK, HINDALCO, BAJAJ FINSERV, ITC, AXIS BANK, STATE BANK OF INDIA, FEDERAL BANK, SUZLON, JINDAL STEEL, ONGC and ITC.